SXM Strong was created on Wednesday, September 6, 2017, with a simple vision: Support the entire community of Sint Maarten/Saint Martin, and disseminate information, following the catastrophic events of Hurricane Irma. 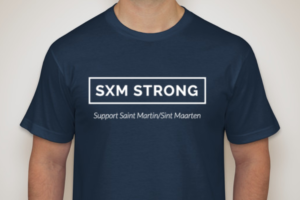 Since those first few days after the hurricane, SXM Strong has continued to support the community of Sint Maarten/Saint Martin.Through funds raised on this website we have contributed to several individuals, families, and NGO’s working on and around the island. Below you will find links to organizations we support, and whom we are partnering with to help provide aid and assistance to the island. We have been very diligent in selecting organizations to give our support to in an effort to ensure the highest level of integrity and organization so that resources will be directed to those most in need on the island. While we do support these organizations, we do not represent them and therefore cannot offer any assurances related to the performance of their stated missions. If you’d prefer to show your support for the island through SXM Strong, you can click here to purchase an SXM Strong t-shirt or hat. A portion of all proceeds raised through SXM Strong will be used to assist and support local communities, local businesses, and to help promote and increase tourism. Started by two Sint Maarten locals, All About a Smile is a grassroots organization that seeks to make the island of Sint Maarten a better, happier place. With the help of people from all around the world, they are fundraising for those in need around the Island. This organization’s goal is to help local communities by making donations of clothing, food, and basic necessities so they can rebuild their lives following hurricane Irma for the long run. 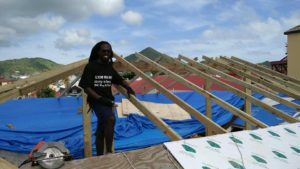 Headed by local property owners, Donny Dicharry and Jon Bobbett, the Saint Martin Lowlands Hurricane Relief Project was initially formed to assist the neediest local families who work in the Terres Basses and Dutch Lowlands regions of the island. These are the people who don’t have the means to repair the damage caused by Hurricane Irma themselves and would otherwise have no choice but to abandon the island in order to survive. We recognize that the level of destruction suffered on St. Martin has created a heavy burden on those who call the island their home. However, we have hope that with the help of many tireless volunteers, as well as with the help of generous donations, the island will revive, flourish, and come back better than it was before. St. Martin is embarking down a very long road towards recovery, and the St. Martin Lowlands Hurricane Relief Project is committed to being there every step of the way. Drae Douglas is a man on a mission to repair 100 roofs. Using his own time and resources — which are scarce — he partners with elderly residents and others in need to help them clean up and rebuild. You can read more about Drae and the work he’s been doing here. SXM Strong has supported Drae with donations raised through our SXM Strong fundraiser. 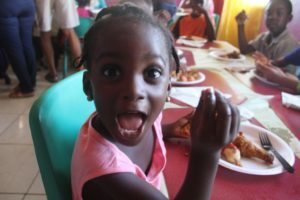 Any donation you make to SXM Strong will go directly to local causes just like Drae. You can also donate directly to Drae through this GoFundMe page. Any donation he receives helps those in need on St. Martin, most of whom have no other options. Because everyone could use a little more reggae music in their lives. 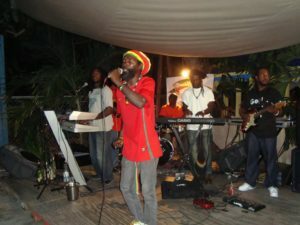 Dread’i is currently based in St Maarten where he has written and created music for the past 17 years. He has performed with many international reggae artists such as: Culture, Beres Hammond, Steel Pulse, Gregory Isaac, Third World, Burning Spear, Shaggy, Tanya Stevens and many more. His musical idols are the great Bob Marley, Peter Tosh, Bunny Wailer. If you get a chance, check out his website, take in some of his lovely reggae jams, and help support a local artist by buying his music. It will bring you closer to Jah, I promise. Note: Please, do not donate to disreputable and unknown organizations, or any new Go Fund Me pages or private fundraisers without doing your research.